Choose from one of the following fine hotels - Burts Hotel in Melrose, The Buccleuch Arms Hotel in St Boswells, Caddon View Country Guest House in Innerleithen; all less than one hour from Edinburgh by public transport, and easy to get to by car. 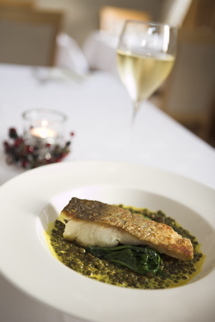 You could leave London on a Friday afternoon and still be on time for an evening meal! We can easily arrange transfers from Edinburgh airport or the bus and train station. You can expect great food (much of it locally sourced), and great Borders hospitality. Hotels with comfort and style but no fuss or formality. All you need to do is relax. Prices will vary depending on location and the time of year. Please contact Make Tracks and we can advise on the best location and price to suit you. "the best local ingredients, simply prepared and well presented." Day 1 Arrive Innerleithen Less than one hour from Edinburgh by public transport, and easy to get to by car. (10m, 16k) A short transfer by car, then a short but stiff climb (to 464 metres, 1,500 feet) taking you to a summit marked by the Three Brethren, massive cairns marking ancient local boundaries. Then a fine ridge walk on an ancient drove road (the Minchmoor Road), taking in a few more summits (to 523 metres, 1,700 feet), Then downhill to Traquair, and a short walk back across the Tweed to Innerleithen. (13m, 21k) Another walk that takes in part of the Southern Upland Way. Walk through Traquair, then easy walking on good tracks (max height 475 metres, 1,600 feet). Then a short downhill section before a lovely walk along the banks of St Mary's Loch to your destination, the famouse old coaching house, Tibbie Shiels Inn - a great setting for a couple of drinks before your transfer back to Innerleiethen by car. (12m, 19k) A 10 minute transfer by car - then another fine ridge walk, with views all the way to Edinburgh in good weather. Maximum height is 600m (2,000 feet), taking in several tops without dropping below 500m. The walk culminates at Lee Pen, the hill that dominates Innerleithen, leaving just a short descent to your comfortable accommodation there. Day 1 Arrive Melrose Less than one hour from Edinburgh by public transport, and easy to get to by car. (7.5m, 12k) A short transfer by car to the pretty village of St Boswells. Then to the 12th century Dryburgh Abbey, sitting in splendour in a long loop of the River Tweed, one of Scotland's best salmon rivers. From there you walk along the banks of the Maxpoffle and Bowden Burns, reaching the small village of Bowden. The last section takes you through the middle (or to the top if you choose) of the Eildon Hills (Trimontium to the Romans who had a fort on one of the summits) to Melrose, with its picturesque market square and another fine mediaeval Abbey. (13m, 21k) Another walk that takes in part of the Southern Upland Way. Walk through Traquair, then easy walking on good tracks (max height 475 metres, 1,600 feet). Then a short downhill section before a lovely walk along the banks of St Mary's Loch to your destination, the famous old coaching house, Tibbie Shiels Inn - a great setting for a couple of drinks before your transfer back to Innerleithen by car. (12m, 19k) A 10 minute transfer by car - then another fine ridge walk, with views all the way to Edinburgh in good weather. Maximum height is 600m (2,000 feet), taking in several tops without dropping below 500m. The walk culminates at Lee Pen, the hill that dominates Innerleithen, leaving just a short descent to your accommodation. As with all our holidays and short walking breaks, the itineraries can be adapted to suit your own specific needs. The suggested itineraries can easily be shortened to 2 or 3 nights, or extended for as long as you like (there are so many great walks in this area). Standard rooms are normally available as well as the advertised superior rooms - and please feel free to suggest any other local walks that you would prefer. We have written guides to just about everything in the area. This break is available beyond the normal season to the end of October. In the months of April, May, and October, the prices are reduced considerably. Prices on application. If using public transport its easiest to get to Innerleithen via Edinburgh from most places (see our Maps & Getting Here page), From Edinburgh, there is a regular service (Firstbus no.62) from Peebles to Edinburgh). By car, Innerleithen is about 45 minutes from Edinburgh, and about 2 hours from Newcastle or Carlisle.